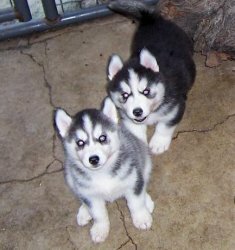 We Offer Siberian husky which come from champion bloodline and imported parents.We Have both male and female puppies available.These are heavy bone, broad head. Heavy muscle, The Siberian Husky is adventurous, clever, and stubborn. guard dog . They have a low heat tolerance, so do not over exercise them in warm weather. The Siberian Husky is not suited to apartment life.We take care of delivery for all over India. No transportation charges. Please call us on 9830064171 or email us at clawsnpawsplanet@gmail.com. Visit us at www.clawsnpawskennel.com.